The art of ikebana is to listen to the spirits of flowers and plants. 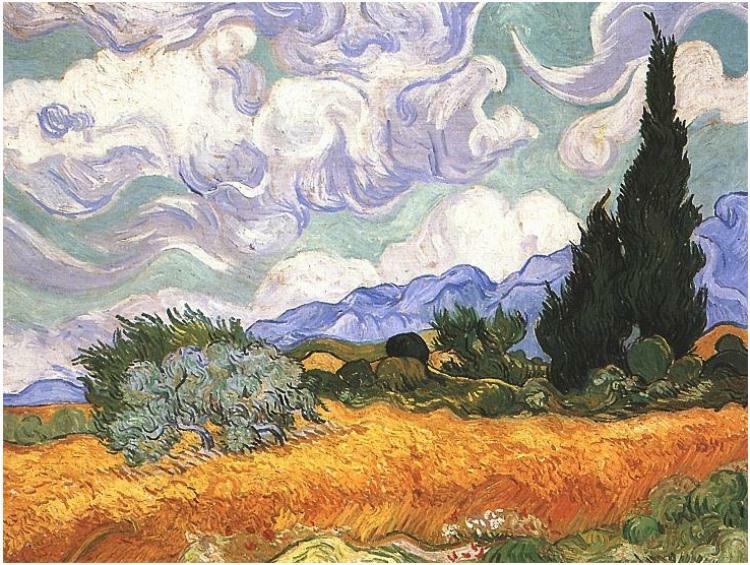 It is how to make the voice or sentiment of the flower a visual combination with your feelings. Ikebana allows the heart of the arranger to touch the heart of the viewer. I see in this quote, and others I could cite, a strong influence from shinto, an earth-centered religion. Followers of Shintoism believe that nature is a spiritual world, inhabited by gods known as kamis or spirits, and those spirits are in everything: flowers and trees, animals, people, mountains, rivers, everything. Those spirits are honored and listened to. People who are influenced by Shinto feel in their heart the beauty of nature and its incredible power. Sen’ei Ikenobo, our own headmaster writes as follows: We are moved by the beauty nature suggests and inspired by her many gifts. Through ikebana we see previously unimagined beauty in the forms of the materials we arrange, beauty we could not have created ourselves. 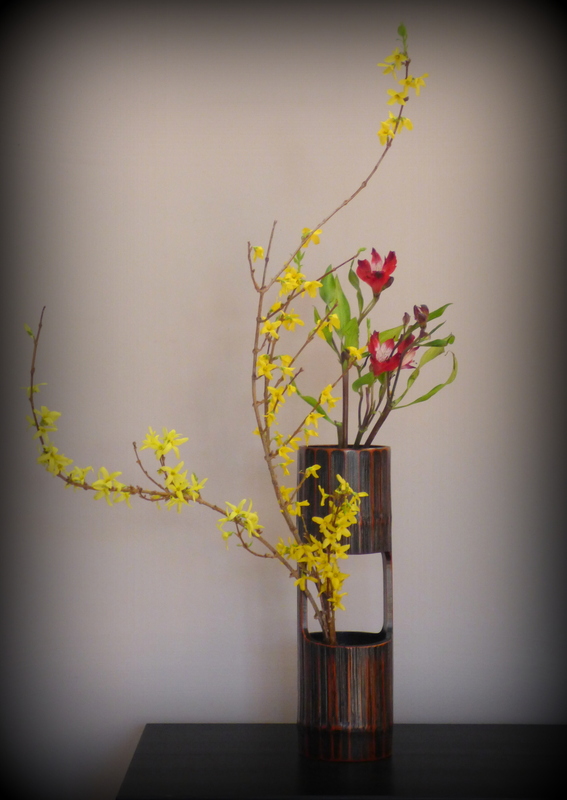 Ikebana, like poetry, comes from the heart and expresses our own spirit as well as those found in nature. 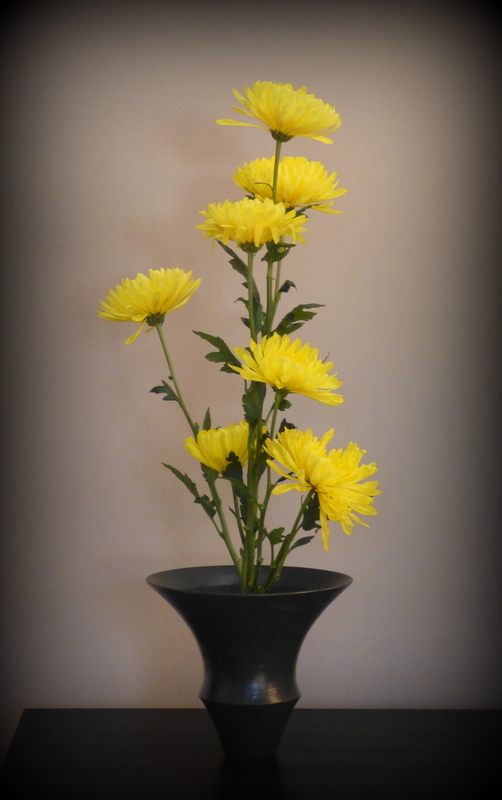 Such was the gist of my sermon, Ikebana as a Moving Meditation . Following the sermon I proceeded to arrange what I called a flower meditation. While arranging, on my knees as in a traditional reishiki-ike, our pianist played Sakura. The resulting arrangement is the one pictured above. For the service, I had also arranged, the day before, a special two-level shoka called Niju-ike offered below. A while back, I signed up for a three week course on blogging offered by WordPress, our host. With daily assignments, it not only kept me on task, it also helped me refine my blog, and more importantly, it allowed us, students, to get to know a number of participants whose blogs we found appealing. We challenged each other, and at times felt influenced by one another. To make a long story short, this gave me the opportunity to discover Un pied ici, un pied là-bas, a blog that piques my traveler’s interests as well as feeds my need to read in French. Her previous post, L’Orchidée Made in France is a pleasure to read and a visual delight. It also gives me a strong desire to work with orchids more frequently. In our exchange of comments I was asked if orchids are often used in ikebana, and I answered that it was but mostly in demonstrations and public exhibitions. I offered to do a post on this topic which was not a terribly wise move. 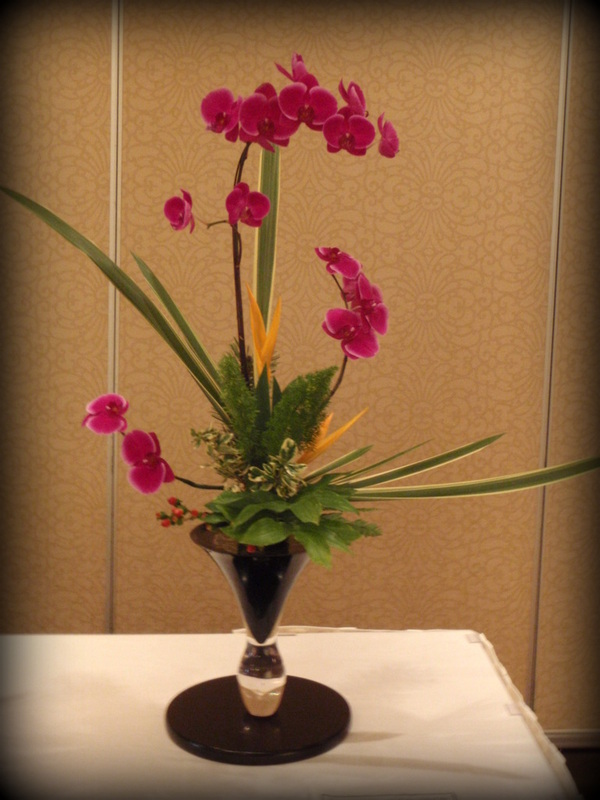 Going through my own picture files, I only found two pictures of arrangements using orchids. 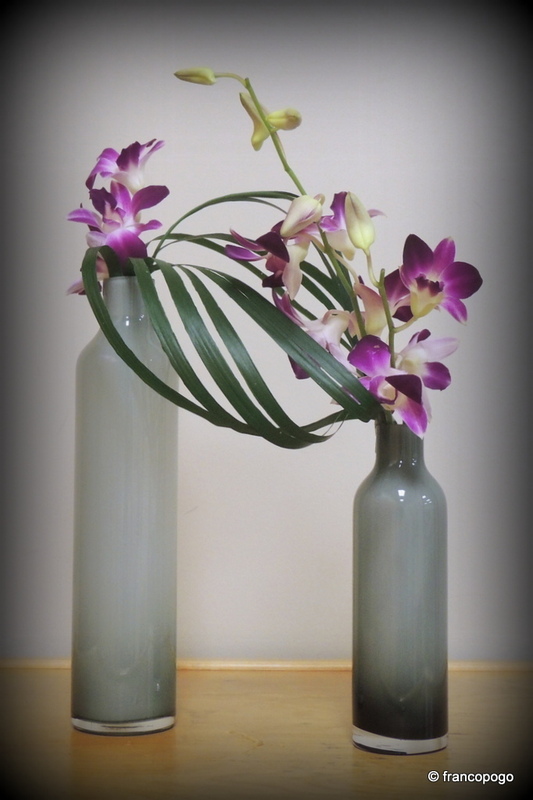 The first one, above, is a simple freestyle (jiyuka) of dendrobium orchids and aspidistra leaves done as a demonstration for my students. The second arrangement, a gorgeous rikka, is the work of a colleague, and was part of a special exhibition for the 35th anniversary of the Vancouver Ikenobo Ikebana Chapter of which I am a member. I had a look through a number of books from the Ikenobo collections and found numerous examples of arrangements featuring a variety of orchids. Orchids are frequently used in Japan where they are considered one of the four shikunshi or Noble Characters, the others being the chrysanthemum, the plum and the bamboo. By googling, I found that there are a number of indigenous orchids in Japan, whether they are used in ikebana, I couldn’t tell. Having promised more than I could deliver, I googled once more not wanting to leave you hanging. Here are numerous images of orchids in ikebana. Until next time I bid you farewell and thank you for visiting.